Call us at 9366-6411 for booking a seat! $10 for one child and one adult, $15 for one child and 2 adults, $20 for 2 children and one adult. 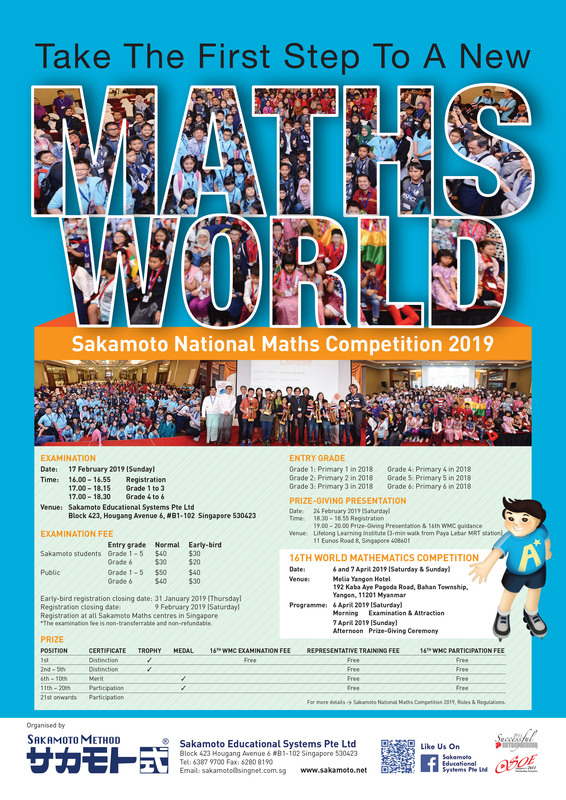 Let's have an experience of Sakamoto Maths together with your child! Souvenirs will be given to all children participants. Parents:"Why is PSLE Maths So Darn Difficult?!" 4.00 p.m. - 7.00 p.m. Call us at 6280-8423 now! Call us at 6280-8423 for more details! New P4: 7.00 p.m. - 9.15 p.m.
New P5: 4.45 p.m. - 7.00 p.m.
New P6: 4.45 p.m. - 7.00 p.m.
Join Asia's Leargest Learning Carnival! Cass us at 6280-8423 for seat booking! Call us at 6565-9575 now! 1.00 p.m. - 3.00 p.m.
4.00 p.m. - 6.15 p.m.
7.00 p.m. - 9.15 p.m.
1.30 p.m. - 2.15 p.m.
12.15 p.m. - 1.30 p.m.
1.30 p.m. - 2.30 p.m. Call us at 6387-9700 for booking seat! SMS at 9366-6411 for booking a seat! Call us at 6387-9700 for booking a seat! 18 June 2016 Let's make Regular Polyhedron with plastic straws Workshop! 6, 7 & 8 June 2016 "Boss for a Cause" Want to be a social entrepreneur? Join a 3-day holiday boot camp! Don't miss out eary-bird discount!